If you have difficulty accessing information on the NAIC websites, please contact webpost@naic.org and provide your contact information, the URL (web address) of the content you are trying to access and the problem you are experiencing. We will attempt to provide the information you're seeking as well as amend the problem. The Adobe Acrobat Reader Plug- In is used to view the PDF standard format. The following links can be used to download utilities to unzip files with a .ZIP extension. The NAIC Service Desk provides technical support and customer service for NAIC applications, products, and services, to enhance productivity within the Insurance Community. To alert the NAIC of security or availability incidents or concerns, e-mail us at Help@naic.org or call the security incident hotline at (816) 783-8558. Having trouble with credit card payment? RSS is a great way to keep up on news, updates, and consumer alerts from the NAIC. An RSS reader keeps track of new information on your favorite sites. Simply download an RSS reader, click on the RSS icon on the NAIC's page, copy the URL, and then paste the URL to your RSS reader. Some browsers have a built-in RSS reader and allow you to simply click "Subscribe" to receive updates from that page. Once your RSS is set up, the updates will start flowing directly to you. Learn more about setting up an NAIC RSS feed. The NAIC Enterprise Architecture is the Information Technology (IT) architecture shared by NAIC/NIPR applications. 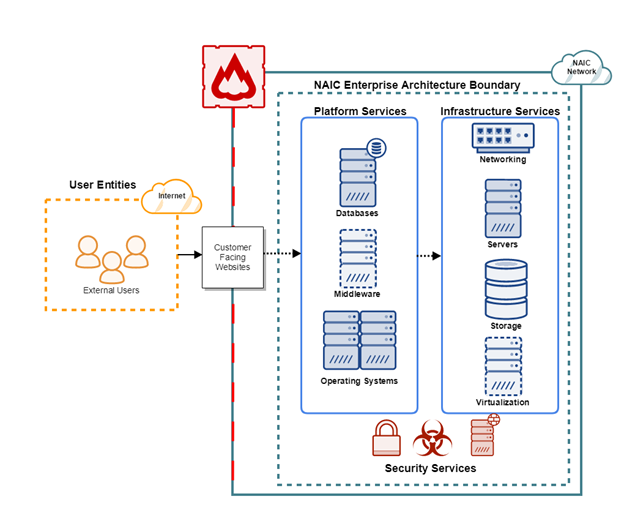 The architecture consists of infrastructure, platform, and security services that provide operational, security, and hosting capabilities to NAIC/NIPR applications. Infrastructure services provide the base level of technology used to provide platform and security services. Infrastructure services consist of, networking, server, storage, and virtualization technologies. Platform services provide a base to develop, run, and manage applications. Platform services include databases, middleware, and operating systems. Security services provide security controls for the NAIC Enterprise Architecture. Security services consist of technologies including antivirus, email security, firewall and intrusion prevention, identity and access management, physical access systems, and vulnerability management systems. User organizations are responsible for the accuracy and completeness of data entered into the NAIC systems. User organizations are responsible to inform the NAIC in writing of changes in authorized staff when the change occurs. User organizations are responsible to read, acknowledge and be familiar with the licensing agreements. User organizations are responsible for complying with federal, state and local agencies. The Internet Filing website is available Monday, Thursday and Friday from 6 AM to 9 PM and 11 PM to 6 AM, and Tuesday and Wednesday from 6 AM to 7 PM and 12 AM to 6 AM. All times are Central Time. The site is generally available Saturday and Sunday but may be taken down for application and server maintenance. Should this occur, you will receive notification on your screen. The IAO website is available 7 AM to 7 PM Monday to Friday, and noon to 6 PM Sunday. The I-SITE website is available 7 AM to 7 PM Monday to Friday, and noon to 6 PM Sunday. The UCAA system is available 24 hours a day, seven days a week, except during maintenance windows. The scheduled maintenance window for UCAA is every Wednesday from 9 PM to 2 AM Central time, and the third Saturday of every month from 10 PM to 2 AM Central time. Any data entered during a maintenance window will not be saved. Technical support is available from 8 AM to 4 PM Central time Monday through Friday. The NAIC Service Desk can be contacted by calling 816-783-8500 or emailing help@naic.org. Additional resources are available on the UCAA website under Electronic Application, User Guides. The hours listed above are all Central time. The NAIC Service Desk provides support for all users of NAIC websites and secure applications. However, we may be limited to the recommendations and requirements listed below when attempting to reproduce any issues reported. We may also be limited in our ability to support Beta or Release Candidate browser software. To report security and availability failures, incidents, or concerns please send an email to help@naic.org. The NAIC does not endorse or require the use of any specific internet browser. However, the websites are tested for reliability and compatibility using Microsoft Internet Explorer and Mozilla Firefox. Using these browsers will ensure that website content is delivered as intended. The NAIC works to maintain websites that are accessible to all individuals—with or without disabilities. While the NAIC is not subject to Section 508 Amendment to the Rehabilitation Act of 1973, we use it to guide page design on NAIC websites. Be aware that links to information created and maintained by other public and/or private organizations are used throughout the NAIC websites. The NAIC provides these links for your convenience but cannot guarantee the accuracy of content or security of these sites. When you select a link to an outside website, you are leaving the NAIC websites and are subject to the privacy and security policies of the linked website. Different file types are present on the NAIC websites that may require third-party software to open. Below is a list of the file types and the third-party software titles used to open them. While most of these file types are proprietary, there are various commercial, freeware, and shareware applications which may be used to read or open these file types. NAIC secure applications and systems have been written and tested against Microsoft Windows operating systems. All NAIC applications and web pages are designed for a minimum screen resolution of 1024 by 768 pixels. NAIC developed applications have been developed and tested using the browsers listed in the "Secure Browser Recommendations" section above. Some NAIC applications may not support all of the recommended browsers due to special application needs and/or possible software issues in browsers. The State Based Systems (SBS) application must use Microsoft Internet Explorer. The NAIC is providing the Google Translate option to assist you in reading NAIC and affiliate websites in languages other than English. Google Translate, which is subject to applicable Google Terms of Service, cannot translate all types of documents and may not provide an exact translation. Anyone relying on information obtained from Google Translate does so at his or her own risk. The NAIC does not make any promises, assurances, or guarantees as to the accuracy of the translations provided. The official text is the English version of the websites. Any discrepancies or differences created in the translation are not binding and have no legal effect for compliance or enforcement purposes. If any questions arise related to the accuracy of the information contained in the translated website, please refer to the English version of the website. The NAIC, its members, and employees shall not be liable for damages or losses of any kind arising out of, or in connection with, the use or performance of such information, including but not limited to, damages or losses caused by reliance upon the accuracy of any such information, or damages incurred from the viewing, distributing, or copying of such materials. The NAIC does not directly endorse Google Translate or imply that it is the only language translation solution available to users.